Lithuania stuns Ukraine Roaring back from a goal down, Lithuania downs Ukraine 2-1 to move up to second ahead of the final round of games. 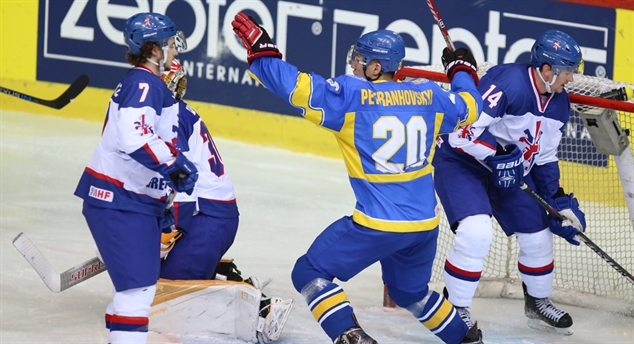 GB going for gold Great Britain surged ahead to beat Romania in their penultimate game to set them up for a gold medal game tomorrow. Homecoming hero Eager to finish off the season on a high on home ice, Croatia steps up their medal hunt bolstered by the arrival of their brightest shining star Borna Rendulic. Ukraine's rising star Sporting a tattoo with the Olympic rings marks the lofty ambitions of Ukraine's Eduard Zakharchenko, who has made his place in net undisputed at the age of 20. Friends in high places Having celebrated fine moments out on the ice with one of the greats of the current game, Aleksandr Kuznetsov still hungers for more victories with Estonia. Breaking point With the Croats eager to give a good account of themselves in front of a home crowd, none of them will have more to play for than 21-year-old Ivan Jankovic. Scoring high in Switzerland Due to the lack of professional hockey at home, some of the best Lithuanian players have moved to many leagues from the NHL to Russia.